Four players: Two teams, two players to a team. A standard deck of 52 cards: Take out the ace through the 9 in each suit, making a deck of 24 cards for the game. 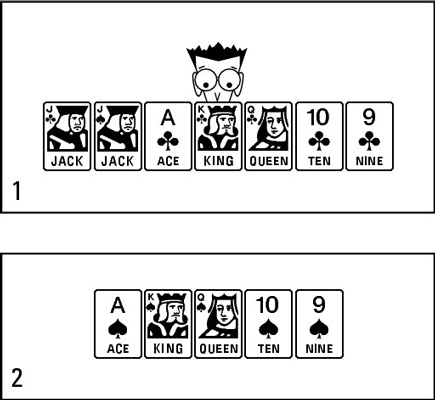 Each player receives five cards, and you play one card at a time; the player who lays the highest card in the suit of the first card played — unless someone contributes a trump, in which case it is whoever lays the highest trump card — collects all four cards together and stacks them in front of him, thus taking the trick. In Euchre, you win a hand and score points for taking the majority of the tricks in a hand, which means winning three or more of the five tricks available. You get more points if you take all five tricks. The first to a specified total of points, generally 10, wins the match. You play the game with partners, but under special circumstances, one member of a partnership can elect to go solo, if he thinks that going alone is worthwhile. You play Euchre with two teams of two players, either with prearranged partnerships or with partners selected by cutting the deck. If you cut the deck for partners, the two highest cards take on the two lowest cards. Make sure the partners sit opposite each other. In partnership games, you almost always sit across from your partner, probably to keep you off each other’s throats. After the deal is complete, the dealer turns over the top card of the four remaining cards. This is called the upcard, and it determines what the trump suit is for the current hand. The remaining three cards play no part in the current hand. The trump suit represents the boss suit, meaning that a trump card beats any card in any other suit. In Euchre, you have to follow the suit that the first player leads (play a card in the same suit), but if you can’t follow suit, you can play a trump card and win the trick (unless someone plays a higher trump card). The standard ranking order applies — within each suit, the ace is high, and the values descend to the lowly 9. The second-highest trump card is the other jack of the same-color suit, often called the left bower. The jack deserts its own suit and becomes a trump card for the hand; for example, the Jack of Spades ceases to be a spade when clubs are the trump suit — it becomes a club. The remaining five cards in the trump suit are the ace, king, queen, 10, and 9, ranking from highest to lowest in that order. For example, if clubs are the trump suit, the cards rank in the order shown in this figure. Diamonds and hearts rank from the ace through 9 in the normal fashion. Card ranks when clubs are the trump suit. The team that chooses the trump suit and then wins three or four tricks scores 1 point. If the side that makes trump gets all five tricks, it marches or sweeps the hand, and the team scores 2 points. If the makers fail to fulfill the trick obligation, the defenders score 2 points (whether they get three, four, or five tricks) — they have euchred the makers. However, the biggest score comes if you go solo and make all five tricks: 4 points. After the opening lead is made, the play goes clockwise around the table. You must follow suit (play a card in the suit led) if you can, but if you can’t, throw off any card or play a trump card as you see fit. Whoever plays the highest card of the suit led, or the highest trump card if one or more trumps have been played on the trick, wins that trick. Failure to follow suit when you can do so is called a renege. You must correct a renege before the winner gathers the trick. If another player identifies a renege, the innocent side may add 2 points to its score or deduct 2 points from the guilty side. If your side is going alone and one of the opponents reneges, the penalty is 4 points. Part of the game lies in memorizing the cards played. You have to think about who may have what cards left to determine what to lead and what to throw away, when you have a choice. For example, the original trump card is one that you want to remember; if the dealer adds it to his hand, don’t forget it. If you have the opening lead and you have two or more trump cards, consider leading them. You should certainly lead a high trump if your partner called the trump suit because it helps your partner locate the missing cards. Otherwise, lead from a sequence if you have one. Start with high cards to help out your partner so that he doesn’t waste his high cards unnecessarily. For example, if hearts are trump, you could lead the Ace of Spades or Ace of Clubs to try to win a trick. Unlike some other card games, saving a winner for a rainy day in Euchre generally has no advantage. Take your tricks when you can, or you may never get them.